Join us for lunch or dinner at City BBQ on Tuesday, March 13th! 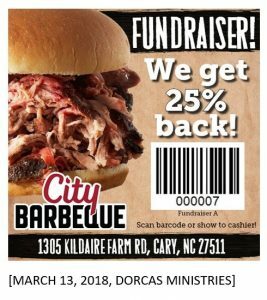 This is an easy way to support Dorcas Ministries – just make sure you bring the flyer (the picture below)! You must have it with you for your purchase to count towards the Dorcas Ministries fundraiser. The flyer can be applied to dine in or to go orders!